For leading the University of Massachusetts to its first NCAA Frozen Four appearance, Greg Carvel has been chosen winner of the 2019 Spencer Penrose Award. 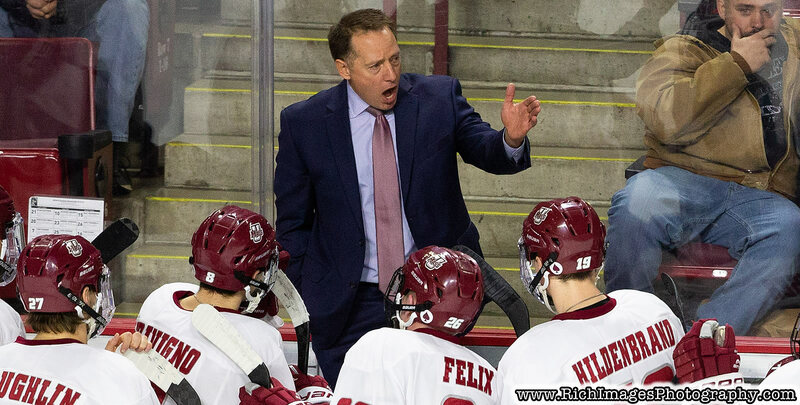 For leading the University of Massachusetts to its first NCAA Frozen Four appearance, Greg Carvel has been chosen winner of the 2019 Spencer Penrose Award as Division I Men's Ice Hockey CCM/AHCA Coach of the Year. The honor is not only a first for Carvel but it also is the first such honor for UMass since it entered Division I hockey in 1993. Carvel will receive his award on Wednesday evening, May 1, launching the American Hockey Coaches Association's annual convention in Naples, FL. UMass enjoyed an historic season, setting new school records in just about every team category. Entering a Thursday semifinal with Denver, UMass sports a record of 30-9-0, the last pair of wins coming in the NCAA Regionals in Manchester, NH. Led by Hobey Baker hopeful and Northeast Regionals MVP Cale Makar, the Minutemen advanced with a pair of convincing 4-0 wins over Harvard and Notre Dame, respectively. A National Hockey League (NHL) coaching veteran and a former Eastern College Athletic Conference (ECAC) Coach of the Year, Carvel was named the 14th ice hockey head coach at the University of Massachusetts on March 29, 2016. Through three seasons in Amherst, his UMass record is 52-58-4. His win totals at UMass have gone from 5 to 17 to 30. Overall, including his 4 seasons at the helm of St. Lawrence, his career mark is 124-121-19. A former Saint captain and the first CoSIDA Academic All-American in SLU program history, Carvel was the first ECAC Coach to have won a major league award as a player and its Coach of the Year Award. He was the 1993 Outstanding Defensive Forward award winner. He had 38 goals and 85 assists for 123 points in 131 collegiate games. Prior to his return to Canton, N.Y., also his hometown, he spent 15 seasons in the professional ranks. He began his professional coaching career as director of hockey operations for the Lowell Lock Monsters of the American Hockey League. He joined the Anaheim Ducks as scouting coordinator in May of 1999, adding video coordinator to his duties in 2002 and earning a promotion to assistant coach in 2003. He joined the Ottawa Senators as an assistant coach in 2004 and was on the staff until the summer of 2011. Both the Ducks and the Senators made it to the Stanley Cup Finals during his time as an assistant coach. Carvel played one year of professional hockey in Sweden and then became assistant athletic director and assistant hockey coach at Canterbury Prep. He earned a master's degree in sport management at the University of Massachusetts in 1998 and was an assistant coach at Amherst College in 1996 while pursuing his degree. Carvel and his wife, Daina, an Amherst native, are parents to Kathryn, Ava and Drew. Assisting Carvel this season were Ben Barr, Jared DeMichiel and T.J. Syner. The runner-up for this year's AHCA Men's Division I Coach of the Year award was Eric Lang, head coach at American International College, regular season and tournament champion in Atlantic Hockey. The Spencer Penrose Award is named in memory of the Colorado Springs benefactor who built the Broadmoor Hotel Complex, site of the first 10 NCAA championship hockey tournaments. The CCM AHCA COACH of the YEAR AWARDS are sponsored by CCM HOCKEY and chosen by members of the AMERICAN HOCKEY COACHES ASSOCIATION. CCM is the legendary hockey brand dedicated to the endless pursuit of performance by delivering game-changing, head-to-toe innovative hockey equipment to players worldwide.